Use the form below to inquire about Royal Resort Stay at Kullu Valley . Use the form below to reserve for Royal Resort Stay at Kullu Valley . The cottage has a living room, a dining area, a kitchenette and two bedrooms. At an altitude of 2,003 meters above sea level, tucked inside a serene Himalayan valley amidst apple and cherry orchards, this retreat is the perfect escape from the harsh heat and pollution of cities. Its flagstone pavement invites guests into a fairytale land that houses a real castle and many opulent rustic cottages. 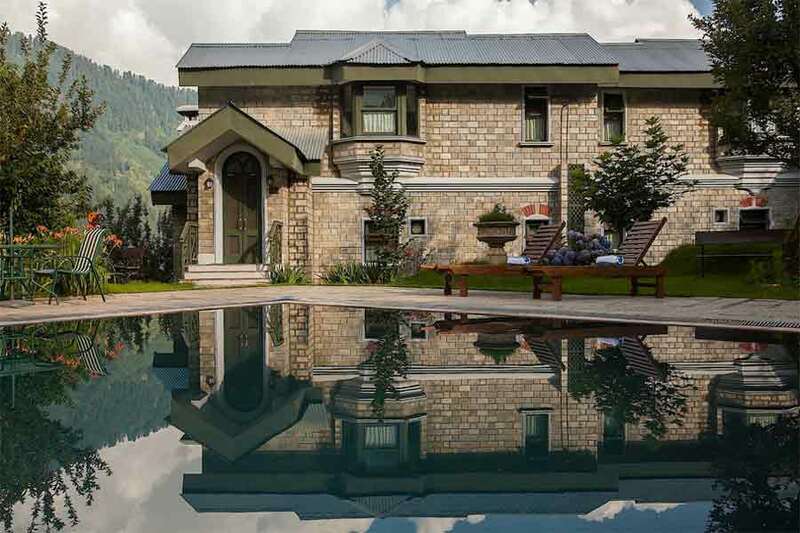 This Royal Resort Stay at Kullu Valley essays a beautiful Gothic grace and might in stone. The powerfully expressive exterior and classic interiors of this Resort shouts aloud its illustriousness in just a mere glance. Exquisite detailing with antique furnishings, medieval arches, wooden paneling. Pompeii-inspired marble floor, cast iron fireplaces, hand-carved Gothic chimneys, intricate clover trelliswork, and a coffered wooden ceiling adorn the interiors of halls, vestibules, the atrium, refectory dining room, vaulted veranda, and the dungeon bar. The turret of the castle culminates at the crow’s nest watch tower, offering a breathtaking panoramic view of Manali valley. This resort leaves an indelible mark on you not only because of its classic outlook, luxurious offerings, hospitality, and its authentic antique deco but also due to the therapeutic views visible from this property. Snow-peppered peaks, mountain streams gracefully cascading down rocks, and the enigmatic deep blue sky brews up a longing in every heart to remain in this retreat for a very long time. Numerous flowers blossom in its artistically landscaped garden. Victorian and contemporary styles are interwoven at each of the castle accommodations. Fireplaces, antique four-poster beds, and armoire, hardwood floors, marble bathrooms with indulgent bath accessories ensure that no stone is unturned in efforts to pamper guests. To add to the experience, cottages have an extra bedroom, a drawing room, dining area, kitchenette and balcony that is flooded with spectacular valley vistas. The kitchenette in the cottage has a stove burner, refrigerator, microwave oven, toaster, tea/coffee maker, cooking paraphernalia, chinaware, cutlery, and glassware. Arches with keystones, Tuscan columns, oriels and bay windows, cavetto window sills, and astragal moldings frame the doors while fenestration adds zing to the cottages. There are a plethora of activities and adventure one can indulge in at this property. The Royal Resort Stay at Kullu Valley assists its guests in trying their hand at various activities including paragliding, white water rafting, skiing, rock climbing, day hikes, treks, picnics, boating, fishing, angling, mountain biking, excursion tours to temples, monasteries, and natural springs. Children five years and below sharing a bed with parent. Retainer/ Maid accommodation in the cottage will be charged extra. The room tariff does not include charges for optional services and incidentals (such as breakage, food, and beverage, firewood, telephone calls etc.). These will be charged additionally. A government approved identity document is required at the time of check-in. A valid photo ID must be presented upon check-in. Identification proof accepted is the passport, driver’s license, or voter’s registration card. 100% advance deposit required to guarantee the booking. Standard check-in time is 2:00 pm and standard check-out time is 12:00 noon. Early check-in or late check-out is subject to availability and may be chargeable. The Resort reserves the right to admission. Cancellation between 15 and 30 days prior to arrival: 100% retention. Cancellation received 14 days prior to arrival: 100% retention. Please be advised, cancellation upon arrival/ no-show/ early departure/ change of dates/ partial cancellation i.e. reduction of accommodation booked will be treated as Cancellation. Just being on the premises of this resort and breathing in the aura that surrounds it is a relaxing and unparalleled activity. At the reading room, styled with classic dark wooden paneling and ceiling, dive into your favorite book - an exquisite indulgence to cherish for a lifetime and one that will take you back to the Victorian era. If weather permits, plunge into the lavish swimming pool, soaking in the warmth of the enchanting Manali valley. A trampoline, tennis court, and gym will keep the fitness enthusiasts on their toes. The state-of-the-art conference room is well-equipped to cater to elite corporate events. The Resort offers assistance for every activity in and around Manali. Dare to go whitewater river rafting through the frothing Beas river at Raison or Pirdi. Float through the air like a bird as you paraglide at Solang Valley, Marhi, Hallan, or Bijli Mahadev. If you visit between January and March, experience the thrill of skiing at Solang Valley which has ski lifts as well as options for snowboarding. Rock climbing, mountain biking, and trekking are extreme sports to give you an adrenaline rush. Day hikes through lesser challenging terrain or strolling through river banks collecting eroded smooth pebbles is a calming experience. Try fishing in the mountain streams and rivers abundant in brown and rainbow trout. River Beas offers the most rewarding fishing experience. Local sightseeing trips which the Resort can arrange are to Hadimba Temple, Manu Temple in Old Manali, Vashisht Hot Sulphur Springs, Tibetan Monastery, Snow Point at Rohtang Pass, Solang Valley, Naggar Castle & Roerich Art Gallery, Manikaran, Malana Village, and Tosh Village. Jeep safaris to Leh, Lahaul, and Spiti during the season takes you through an unmatched experience of traveling through highest altitudes in India and will enrich you with visuals of most rugged and scenic terrains on earth. Shimla is the nearest airport to Manali. But Chandigarh has more frequent flights connecting it to the rest of India. Chandigarh to Manali is 310 km (appx 8 hours) while Delhi is 570 km (appx 12 hours) away. From Chandigarh, head towards Kharar to hit the NH205. Stay on NH205 until you reach Nauni Chowk. At Nauni Chawk, drive straight up onto NH154. Stay on NH154. At Ghaghas Chowk, NH103 merges with NH154. Stay on NH154 until you cross Mandi. After crossing Mandi, NH154 deviates left at the Bhiuli Bridge. Drive straight without taking the left to the bridge. Take the straight road to NH3 and keep driving till you reach Manali.